An adjustable walking frame, from Active Mobility Centre. 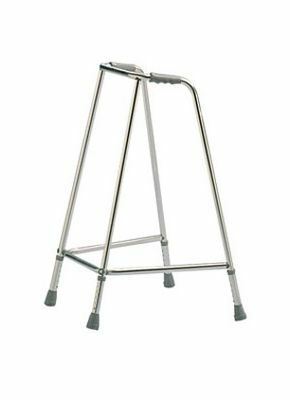 This is a sturdy yet lightweight adjustable zimmer frame that can be used to provide support when walking. Designed to provide additional support for disabled, elderly, or just for those that have difficulty walking, this item has large profiled hand grips that will fit your hands like, well – almost like a glove! Built to last, and capable of supporting even the larger person (up to 25 stone). This is a product that you’ll have for a long time – a great investment! The four ferrules are made from quality rubber, and have been designed with safety in mind – you’ll find it very difficult to slip with these, even on tiles or smooth surfaces.